Size: 5.0" x 2.7" x 0.9"
Any idea why you discovered this non-TI calculator within the Datamath Calculator Museum? 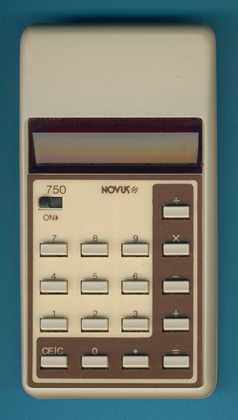 Zayre Corporation sold in 1976 a slightly redesigned Novus 750 calculator as CONCEPT 10. Dismantling this Novus 750 calculator manufactured in May 1976 reveals a very simple, yet efficient technology called chip-on-board (COB) technology. Instead of the traditional approach with a plastic-encapsulated Integrated Circuit (IC) soldered on the printed circuit board (PCB), achieves COB-technology direct wire bonding of the IC to the PCB. © Joerg Woerner, February 4, 2010. No reprints without written permission.